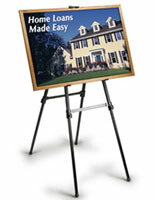 These Durable Display Easels are Rugged Yet Look Elegant in Every Environment! Peruse the Whole Collection of Presentation Equipment Online Any Time! 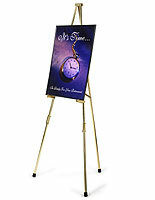 Display easels are great in a hotel lobby, convention hall, library or a classroom. 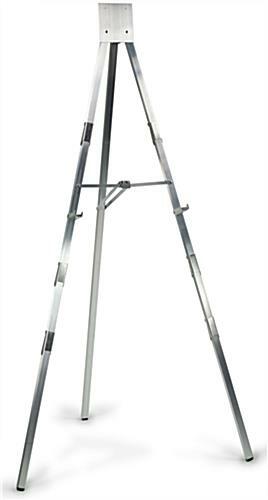 The overall height is 6' when in use, and features a very stable tripod construction. Each of these display easels features a rubber tip on the bottom of each leg to prevent the units from scratching the floor. The satin silver finish adds a touch of class to any sign, poster or piece of art being displayed. 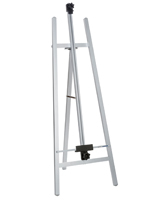 These display easels are very sturdy and can hold as much as 50 lbs. when necessary. There are four height settings that the supports can be placed on this tripod. These display easels feature (4) "fold flat" sign supports to give users the option to have a sign or chart as low as 20" and as high as 52" off the ground. 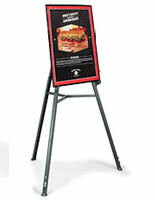 Buy these stands for a restaurant, lobby, or business presentation. 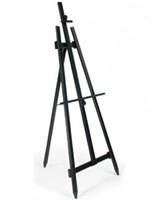 These display easels have a very classy satin aluminum finish. When folded, the dimensions are 73" high x 4-1/2" wide x 1" deep. When not in use this aluminum tripod folds flat. 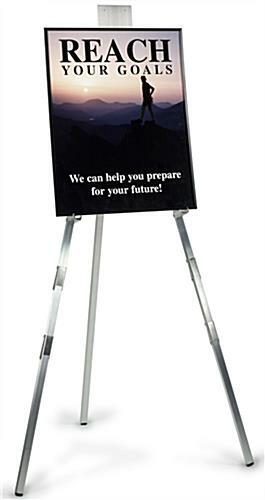 These display easels are easy to maneuver and bring along to a tradeshow or public speaking event. 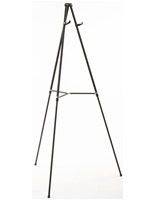 The basic design and neutral finish make these tripod stands a popular choice among retailers, hospitality venues and other commercial settings. Each of these display easels ships assembled, ready for immediate use. These fixtures are offered with same day shipping when in stock and ordered by 1pm EST. 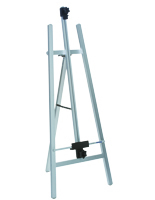 Buy these display easels for your business today!